Even busy people will look up at the stars in the middle of the night, eager to explore the unknown universe. With the rapid development of the earth civilizations, we have passed through the steam era, the industrial age, and entered the era of science and technology, but our beautiful mother earth is quickly becoming more and more uninhabitable. Problems such as smog, desertification, extinction of species, and so forth have emerged. Maybe it’s time to find another habitat! The universe is so vast that we believe there are planets that allow humankind to survive. Brave travelers, take risks for the happiness of all humanity! Space Colonizers is an incremental idle space clicker game, and also a simulation & strategy game developed by the Capplay team which hold great curiosity and enthusiasm for the universe in this game. 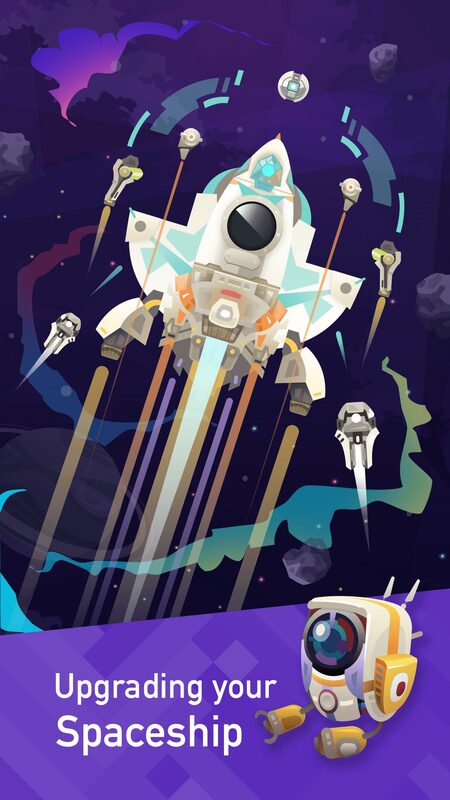 By tapping the screen, let your spacecraft rise into space. 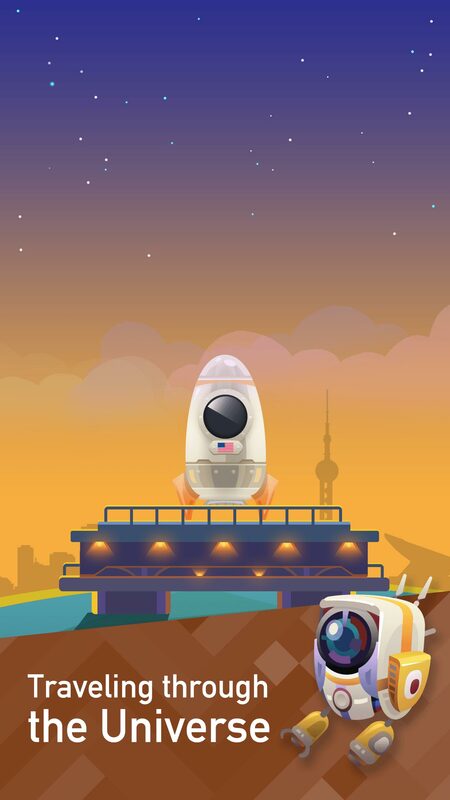 In order to reach new and beautiful planets – one after another – you must complete tasks in order to get coins and dark matter which is used to install new parts on your spacecraft and upgrade it. When you reach a new planet, explore it! 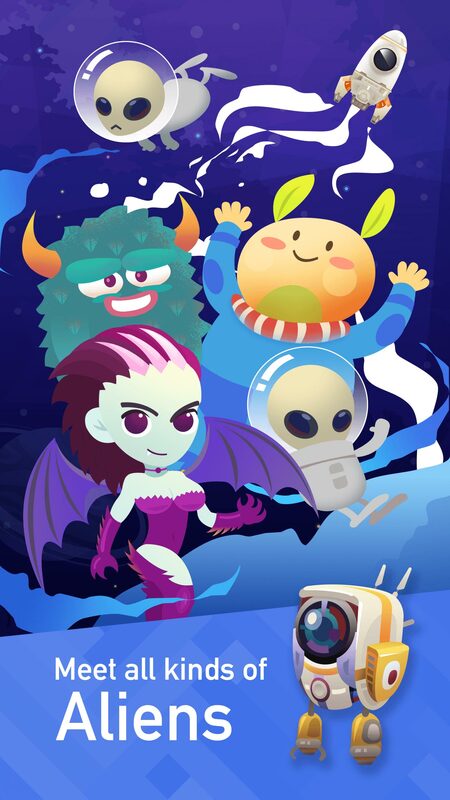 Get coins or dark matter, and maybe even aliens, which – funny or cute – can all help you in your exploration! Small meteorites flying in the universe can bring you income. Occasionally, a small spaceship is also a good opportunity to increase gold coins or dark matter. As you fly, you may encounter a black hole you can use to instantly pass through space and time, allowing you to quickly shuttle through the universe. When you leave the solar system, you may encounter planets suitable for human habitation. Do not forget your great mission, return to earth, bring hope to humanity, immigration of some human beings, and continue to explore! Explore even further through more peculiar planets, where you can meet more cute aliens, you have to constantly install parts, upgrade your spacecraft, and build buildings. Don’t forget to use your skills to make yourself fly faster! Maybe you will feel lonely as a solitary person. Don’t worry! Heroes all over the world are exploring with you! People around the world can create guilds together and build a space station that belongs to their own team and increases the speed of their spacecraft. Come and join them! We are Capplay, an Independent game development team from Beijing, China. We are dedicated to improving our game quality and focusing on delivering a unique player experience. Developing more fun games is our goal and mission. Follow Capplay on Facebook for insight on future releases! This article was Published by Edamame Reviews, Written by Capplay.